After his wife is murdered, a homicide detective develops multiple personalities and takes revenge on her killer. Years later the killer seems to reappear from the dead. When his beloved boss is killed, a dangerous young gangster cuts a path of vengeance through the Japanese mafia. I'm going to do something unusual here. I just watched the first two episodes (out of six) of MPD Psycho, and I'm going to review what I've seen--the beginning of the story, basically. Once I can watch the whole miniseries, I'll supplant this review with a new one. I would have never watched just the first two episodes, but I always try to know as little as possible about a film before I watch it. I expected that MPD Psycho would just be another Takashi Miike movie. I didn't realize that I was wrong until the first episode ended at 58 minutes. I thought, "That's it? There was no ending and that was so short!" Well, of course there was no ending and it was short. I'd only watched episode one of a six part miniseries. Even when episode two followed the credits (I'm glad I always watch to the end of the credits), I still didn't realize the disc wasn't complete. I would have never watched the first two episodes if I had known that the rest of the miniseries not only wasn't on the DVD, but won't even be released for another few months, at least. Why do DVD distributors do this? I would have gladly paid more to receive the whole thing at once. Doing it this way just annoys me and makes me want to avoid Ventura DVDs. Admittedly, it's my fault for not paying more attention to the marketing, which was somewhat upfront about the incompleteness, but as I mentioned, I prefer watching films knowing absolutely nothing about them beforehand, if possible. Anyway, on to the episodes I watched. As others have noted, MPD Psycho seems to be Miike's "Twin Peaks" (1990), peppered with plenty of bows to Japanese genre conventions (the phone as a source of horror, regular rain, freaky young women, etc.). To a large extent, it's a police procedural, as was "Twin Peaks", and it's full of Lynchian intentional crypticness. Coming from a director who naturally tends to be cryptic, and where that is the expected norm for the genre in his culture, MPD Psycho, with its intentional stab at Lynchian weirdness, is extremely dense. In other words, you're not likely to be able to figure out what the heck the story is about by just watching the first two episodes. It has something to do with a former detective, Yôsuke Kobayashi (Naoki Hosaka), who quit the force after a particularly hairy case. Kobayashi was after a serial killer who targeted pregnant women. At the beginning of the first episode we see Kobayashi crack when he encounters the serial killer, who had just done a number on his wife. Enter the "MPD" of the title--Multiple Personality Disorder. Kobayashi is now living in a small town, with a new wife, who oddly has the same name as his former wife and who looks a bit similar. There's a new serial killer on the loose who turns women into potted plants--he cuts off the top of their skulls, exposing their brain, and puts a flower in the middle, often burying them up to their heads below the ground. The pregnant woman killer also seems to be starting up again, even though Kobayashi killed him (they think it might be a copycat, although elements of the crimes that were never publicized are duplicated). Plus there's some bizarre stuff about possession via telephones or the Internet, chimerical women in some kind of "waiting room", they keep going back to this odd Ferris wheel, there's a bit of animation, a number of people have a bar code tattooed on the bottom of their eyeballs, and so on. I can only guess that much of it will make a bit more sense by the end of episode six, but knowing Miike, episode six might end with as many unanswered questions as episode 2 does. Keeping with what is seeming like a tradition from Miike to me so far, MPD Psycho displays yet another style from him. It has an odd look, largely because it was shot on budget digital video cameras and a number of shots have been processed/manipulated in Photoshop and/or similar software. 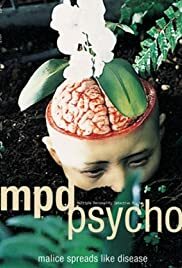 Although the digital video can give MPD Psycho the look of your average cheap soap opera, the software manipulations are often effective, as Miike tends to use them to make MPD Psycho more surreal. There are also some wonderful, odd angles and set-ups, such as the circling scene inside the Ferris wheel car (despite the camera/tripod shadows), and a Miike incorporates a lot of unusual, highly aesthetic blocking of his actors. Some have said that the gore and more challenging images have been "covered" by pixelation, but the pixelation varies greatly in structure depending on what's being covered, and not everything pixelated is a controversial image. It seems more like an intentional stylistic device. It's especially effective but bizarre when integrated with the skull/brain flowerpots. The music that accompanies the "dangerous" telephone calls is sublime and freaky for being so acultural. It sounds like a Beatles-influenced Anglo-Saxon band, like Kula Shaker. The song also provides possible clues to the subtexts of the film in its lyrics--"Sing to the sky, in this strange new world". MPD Psycho, at this point at least, seems to be about (re)birth and death--the life (and reincarnation) cycle as a means of transformation. This is perhaps also the reason for Kobayashi's fluctuating personalities, each undergoing their own (re)births and deaths. Time will tell, when I can finally watch the ending. There's a good chance my rating will improve in light of the complete MPD Psycho. The miniseries will certainly be worth watching, but unless you do not mind a suspended, complete lack of closure, avoid the DVD release until the whole thing is available.